Just after I moved away from Elm Avenue, Jayne Wells moved in, two houses up. When I met her the next fall, I complained to my husband, "I can't believe that bad timing. She is so great. It would have been fun to be her neighbor." I've loved getting to know Jayne through her blog. She is thoughtful and beautiful and hilarious. 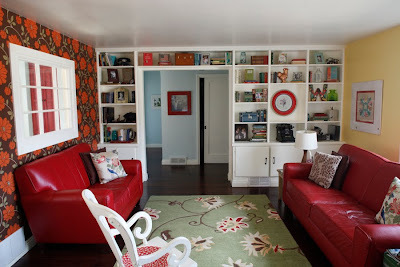 One day, while looking at some pictures on Jayne's blog, I noticed that her home was darling. Really darling. So I asked my would-be neighbor if she would do a home tour on Bloom, and she happily obliged. See? I told you she was great. Thanks for being here, Jayne! Anne: You have so much great color in your home. How did you go about choosing colors for walls, furniture, etc? 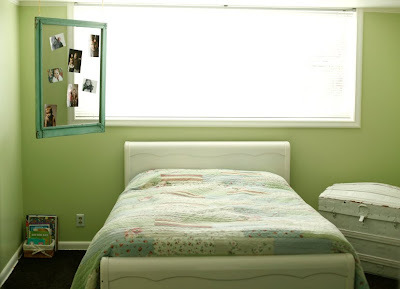 And, what advice do you have for people who are afraid of using bold colors or mixing colors? Jayne: Color makes me happy, so I've never been scared of using it. 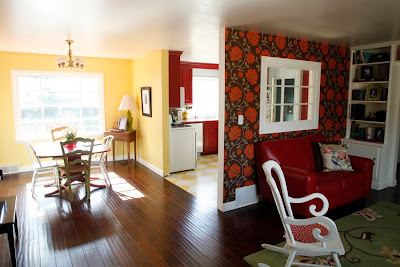 Red is my favorite color, but I have a lot of accent furniture and decorations in red, so for the last two places I've lived in I use yellow in the main room. I love the sunshine, and I guess yellow must provide that in a little way for me. My suggestion to any who are afraid of using color is to simply try it! Bring home paint samples and test them out with your furniture and accents. You may find you really love it! Anne: You have such a great eye, Jayne. 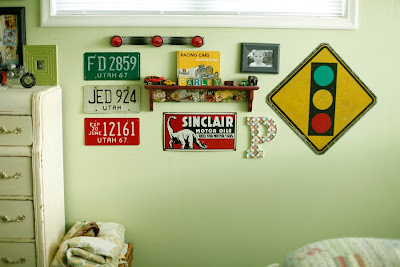 The way you put things together on walls, use antiques to accessorize, etc. Do you feel like that's something innate in you, or have you made a study of it? Jayne: Gosh, I don't know. I think some of it must be innate, while some, I'm sure has come from looking at a lot of magazines, visiting a lot of antique stores and studying others' decorations. Anne: I know you love Country Living. What else inspires you? Jayne: Yes, I love Country Living and other magazines like it. I also just love to see what others do in their homes. I enjoy many styles and seeing what other people come up with inspires me a lot! Anne: What a great window between your kitchen and living room. Did you put that in? Jayne: We did put the window in. It used to be in the house that I grew up in. My parents got new windows and gave me that one. I wanted to keep the wall there to separate the two rooms, but I needed more light in the kitchen, so we put the window in. I love it--I feel it opens up the kitchen and I can also spy on my kids in the other room! Anne: Wow, I am swooning over your kitchen! 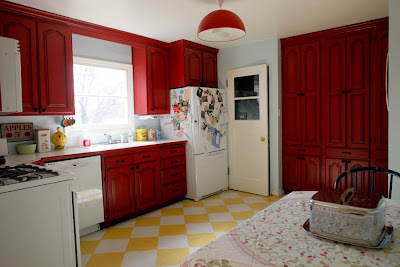 Did you paint the existing cabinets red or install new ones? Tell me about your floor. Jayne: The cabinets were in great shape when we bought the house, very nice quality oak. Jed and I aren't big oak lovers, so we had them painted. We painted most everything in our house--but I trusted the cabinets to someone with a little more experience--especially since they're red. Red is hard to paint with I think! My floor is Vinyl Composition Tile from Home Depot. I was really interested in a checkered floor and had checked into something called Marmoleum. It was darling but so expensive (more than the wood we put in!) and then I ran into this VCT at Home Depot. It is the same stuff that is used in elementary schools! It was so cheap (I think about $.50 for each tile) so I was thrilled. It is a lot of maintenance, I must warn you of that--it shows all the chocolate milk and yogurt that get spilled on it. I spend a good amount of time mopping! Anne: It seems like you have a lot of unique, vintage furniture (this vanity in Hazel's room is to die for). How have you acquired it? Have you fixed it up/painted it all yourself? 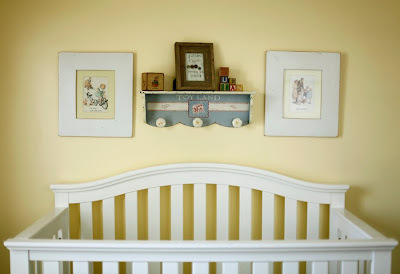 Jayne: Some furniture we have inherited--such as the vanity, bed and chest of drawers in Hazel's room, they belonged to my great-grandma. 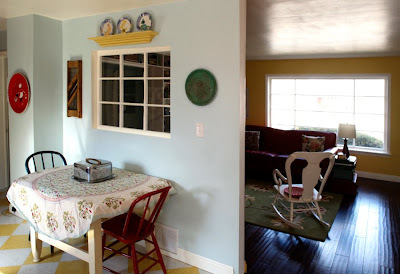 Other furniture we have been collected from family or garage sales and have fixed them up--the red dining table and yellow armoir (in the master) are two that we (Jed!) has fixed up. 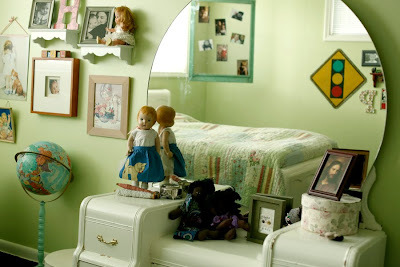 Anne: All of the decor in your children's rooms is so sweet and unique. 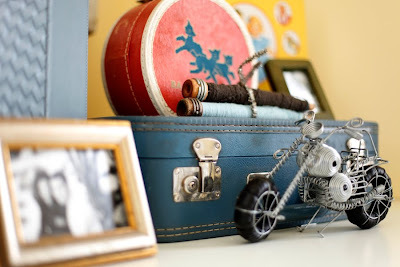 Are you a big thrifter/antiquer or do you have a lot of family heirlooms? Jayne: I love antiques. And most of the things I've gotten come from antique stores and fairs. Some things, including lots of books, have come from library sales, or thrift stores. But antique stores and fairs delight me, because I can usually go with $10 and come home with some treasure. Sometimes it is small--like blocks for the kids names or the apron on Hazel's doll. But other times I find a killer deal and bring home an old adding machine or crock. 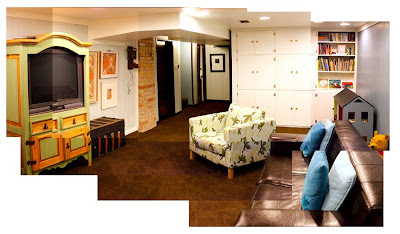 Anne: I love this artwork in the basement. Is that framed wallpaper? Jayne: Thanks for liking that! 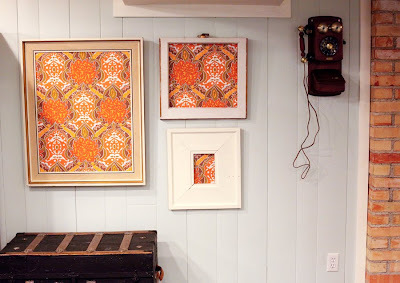 Yes, I found the vintage wallpaper at the Country Living fair this past year--and we wanted to use it on actual walls downstairs, but we have grooves in the walls, which are painted wood panneling, so wallpaper was going to be hard. So we improvised and framed some pieces instead! Jayne: Like I said, the home itself is fantastic. I will praise Grant Fisher's name forever for building such a wonderful place. We changed a lot of things to make it our style. We put in all the flooring, painted/wallpapered everything, knocked out a wall--but other than that, I inherited greatness! The mantel was there, windows are original and built ins were there too! I also got some fantastic shade trees outside! Thanks again, Jayne! Readers, raise you hand if you think Jayne should send these pics in to Country Living for a feature article! What a beautiful home! I'd love to see more tours featured here; so fun to get a peek at real houses that are still totally magazine-worthy. Where are your favorite spots to browse for throw pillows and rugs? I'm looking for both and having a terrible time finding things I like. And Jayne, were the floor tiles a pain to put in? They're not the peel and stick kind are they? Love it! Love it! Love it! Soooo fun and so pretty and so just lovely! I found a super buy this weekend: a 1930's pedal sewing machine. I love it! I will email you a picture. The best part: it was FREE! Jayne is so brilliant and creative. And the best part is, she's even more amazing as a person! I love it! I wish I had her eye. I would love a cute house like that but would never be able to pull it all together like she has! Thanks for being so nice all of you friends. 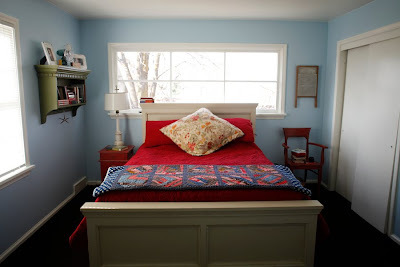 I wish I had a go to answer for my pillows and rugs--I like to look everywhere, and I'm kind of cheap, so I have to look hard. I found my bird pillows (upstairs couch) at Target as well as the blue ones downstairs. I also saw some super cute yellow ones on the cover of Country Living 2 months ago that were from Target--so that might be a good start. My big rug is from Pier One--I know sometimes it is pricey there, but you can also get a deal if you're looking! If it were possible to hate that Jayne Wells a little, I would. Only because I love that house too much. However, it's impossible to hate that girl. Instead I just have to love her and her house. Darn! What a fun treat! I hope to see more home tours. Love your house Jayne, very creative and talented!!! I am obsessed with the hanging frame/plexi glass piece. Please give a HOW-TO on that piece, it is incredible! Adriene--I'm still hoping you're moving here. Hoping, hoping. @Sallie--I'm guessing you mean the turquoise screen in the kids' room with pictures on it. It is actually an old screen with real a real metalic screen, so the pictures are on there with magnets! So, actually easy easy! I have a screen or two that isn't metalic, so I can't use them the same way. So make sure it's metalic, then you're set! *SIGH* I'm in love! That kitchen is awesome!! I love all the color, it makes it feel cheerful to me. My husband liked a darker look when we were first married so we compromised and now he sees the light and agrees with me! 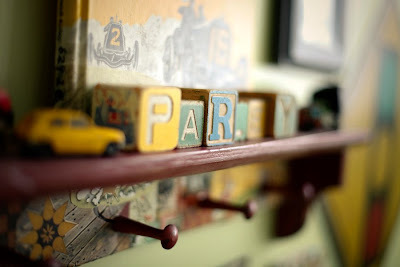 ;) Starting over with decor takes time but I LOVE peeking in on others homes for inspiration. Thanks for the look inside! jayne i love your house! my sister put marmoleum all over her house and said because it is natural it gets major water damage. After putting in such an expensive product she removed it pretty quick- good call! This post made me so happy. What a gorgeous home! I love red which is probably why I'm in love with the color scheme. 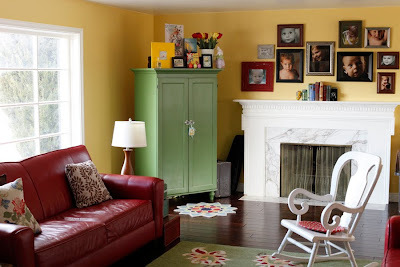 What a great job complementing colors in your open spaces. Your red couches are yummy, and your kitchen cabinets...laaaa! I have oak and didn't know it could be painted to look so fabulous. Thanks for the inspiring design Jayne! More please! I'm slightly obsessed with homes and decorating - I would more more of this! This was awesome! 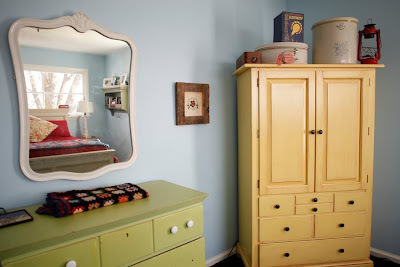 I am wondering if she painted her armoire's and dresseres herself and any tips there. beautiful! i love the color! Totally think she should submit these pictures to Country Living!!! I LOVE this house! The colors she used are what I've always held in the back of my mind and now seeing them makes me think I need to put those thoughts into actions and paint my walls. I don't think I will be satisfied until then! Thank you so much for sharing!